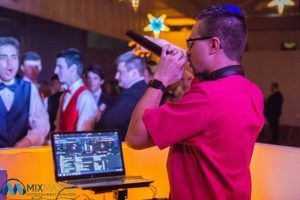 Not all of the time our business is focused around weddings but did you know not only do we do weddings but we did sweet 16’s, other special occasions, and PROMS! That’s right I was called out to do South Williamsport Areas High School Prom which took place inside The Clearstory which is located on the second floor of The Pajama FactoryThe theme for tonight’s prom was “under the stars” so naturally the students had big stars that lit up hanging from the beams of The Clearstory. The nice thing about this venue is you really can trick it out to be whatever you want it to be.. there is just so many options its has endless opportunities with the themes you can come up with. I had wanted to do some testing of our newer uplighting we recently purchased at the venue so along the one side of the wall we put some lights that went along to the beat of the music. I brought out the big powerful speakers and had things thumpin’ check out some photos below and thanks SWHS for rocking with me!